This data set reconstructs the census compilation and dissemination geography of the 1911 Canadian Census at the census division (CD) and census subdivision (CSD) level of geography. The shapefiles (.shp) were derived from a comprehensive geodatabase, as part of the Canadian Century Research Infrastructure (CCRI). Detailed water polygons were replaced with a selection of major lakes in this version, indicated with the abbreviation MW in the file name, which stands for ‘major water’. These data are a part of a geographical framework constructed to enable the location, selection, aggregation, and analysis of census data, for census enumerations between 1911 and 1951. Metadata was created using metadata provided by University of Alberta Libraries. This shapefile was created by the Canadian Century Research Infrastructure (CCRI) project, and consists of boundary polygons that reconstruct the census compilation and dissemination geography of the 1911 Canadian Census at the census division (CD) and census subdivision (CSD) level of geography. It can be used on its own with the attribute data fields included in the file, or it can be joined to other tabular data based on a linking field and a unique identifier (CCRIUID). Principal funding support came from the Canada Foundation for Innovation. The provinces of British Columbia, Ontario, Quebec, and Newfoundland and Labrador provided essential matching funds for the work done in their respective provinces. The eight participating universities provided significant further assistance as did project partners Statistics Canada, IBM, MITEL, the Harold Crabtree Foundation, the Newfoundland and Labrador Statistics Agency, L’Institut de la Statistique du Québec, and Library and Archives Canada. The file was generated from a comprehensive geodatabase created by the Canadian Century Research Infrastructure (CCRI) project. As part of the shapefile construction process, detailed water polygons were deleted and replaced with a selection of major lakes. In order to distinguish this file, as defined by that characteristic, from other versions, the file name includes the abbreviation MW, which stands for Major Water. The 2001 Census geographic files produced by the Statistics Canada Geography Division constituted the primary reference base. Care was taken to conform as much as possible to the precedents set in level of detail and coding in this modern reference source. Other modern GIS reference sources, such as the National Topographic Data Base and provincial base layers at appropriate scales, were used to supplement this source. Historical sources, primarily maps from Library and Archives Canada, were used to identify and guide the editing of the Statistics Canada geographic files to reconstruct the boundaries of the 1911 census. Some background information on the initial planning is found in the article : "Geocoding and Mapping Historical Census Data: The Geographical Component of the Canadian Century Research Infrastructure", by Marc St-Hilaire, Byron Moldofsky, Laurent Richard and Mariange Beaudry, Historical Methods, volume 40, Number 2, Spring 2007, p. 76-91. DOI: 10.3200/HMTS.40.2.76-91. 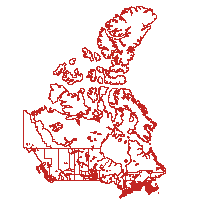 Statistics Canada: Subdivisions Cartographic Boundary File. 2001 Census: Adapted from Statistics Canada, Census Subdivisions Cartographic Boundary File, 2001 Census, Second Edition, 2002. This does not constitute an endorsement by Statistics Canada of this product.